If you're feeling overwhelmed and need to get organized, you just might find that using a to-do-list for the types of tasks you are trying to manage can be very helpful. 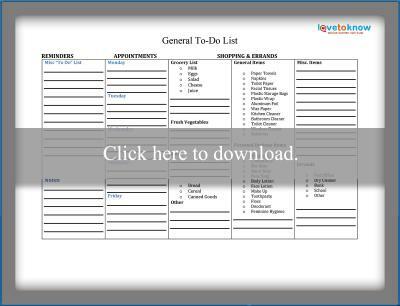 Not everyone has the same organizational challenges, so LoveToKnow has created a selection of printable to-do lists, checklists and other helpful documents. 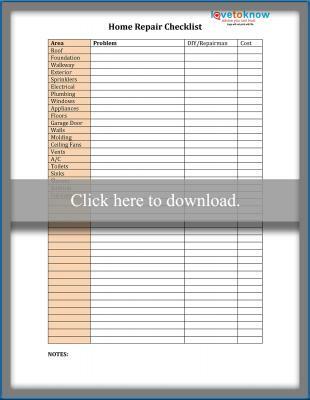 Download, print and use the ones that will be most beneficial to you. Get a jump on the holidays and special occasions. 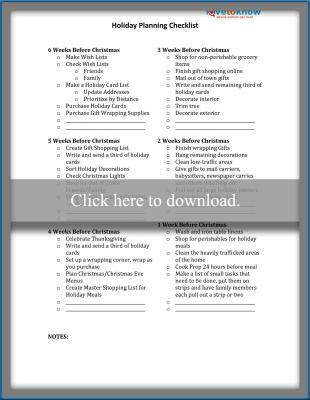 Lists keep you organized during the busiest times of the year. 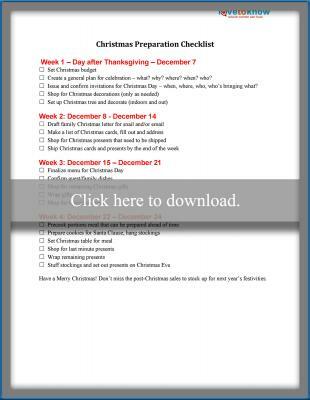 Take the stress out of the countdown to Christmas with this helpful list of to-do items with checklists for each timeframe. 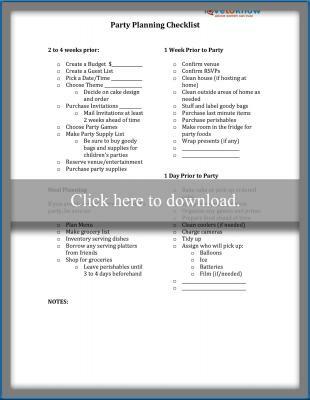 Enjoy having a head start on family birthday celebrations when you use this planning guide and supply list. 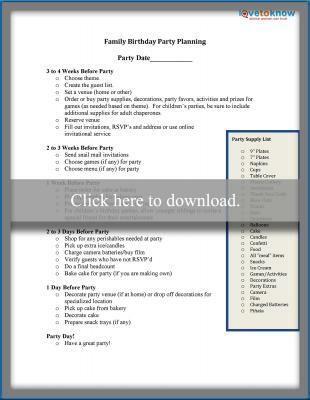 Take the stress out of planning special celebrations with this party planning timeframe guide. 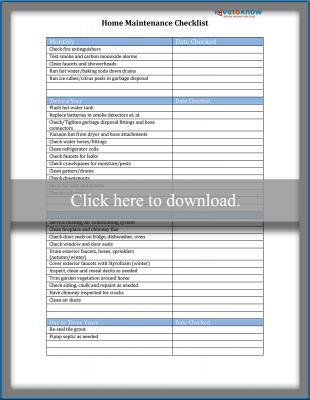 Make easy work of vacation planning, trip preparation and packing tasks with this handy guide. Keep the house spotless with ease. Everyone can help do their part with these organizers. Use this fill-in chart to help keep your children - and the entire family - organized. Use this helpful fill-in framework to keep yourself organized throughout each week. 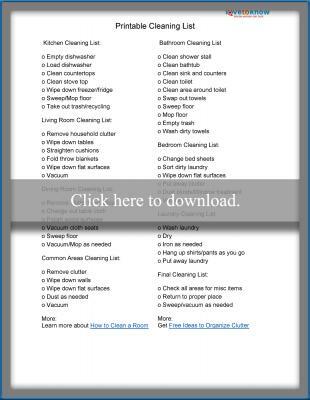 Keep up with household cleaning tasks with this easy-to-follow pre-formatted list. Save time and money at the supermarket with this helpful fill-in list. Don't let seasonal projects sneak up on you. These lists won't let you forget a thing. 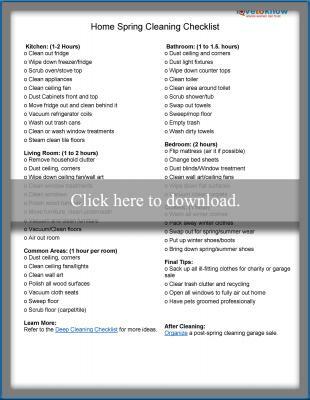 Make easy work of annual spring cleaning with this comprehensive list of seasonal tasks. 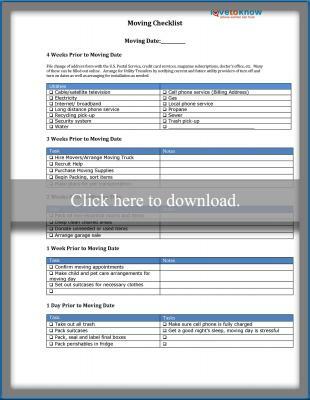 Stay on top of completing household maintenance tasks in a timely manner with this useful document. Keep track of the dates specific home repairs were completed with this handy guide. 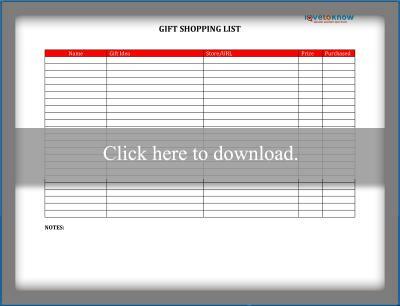 Make special occasion shopping easier with this helpful form. 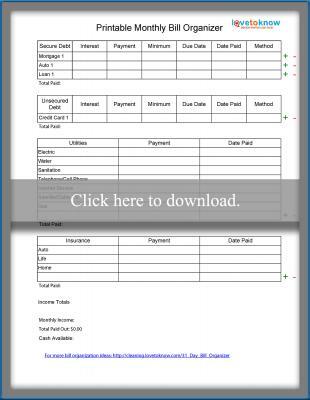 Stay in budget with forms that make your money work. These charts and checklists will keep your finances organized. Keep track of the donations you make throughout the year so you have good records when tax time rolls around. 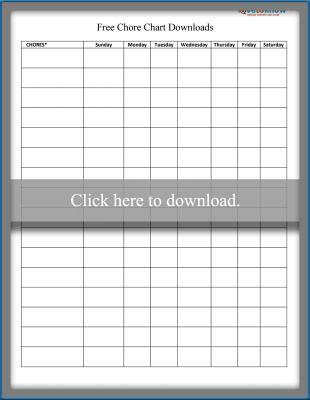 Use this printable form if you need an organized way to keep track of your expenditures. 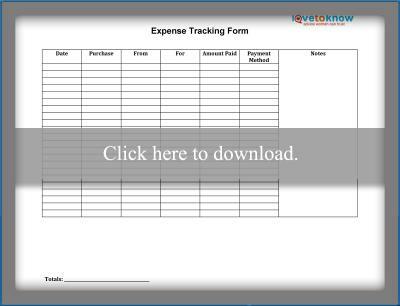 Keep up with your monthly bill-paying tasks in an organized manner with this form. Manage the family without fuss. Keep everyone on schedule and in-the-know with these handy lists. 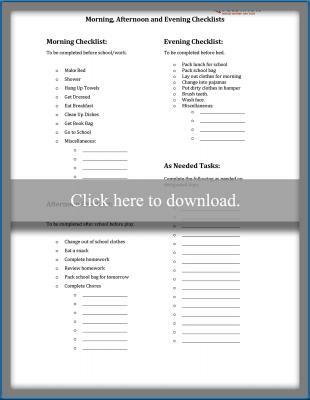 Help organize your kids' schoolwork with this daily homework checklist that can be used for any grade level. Fill out this form before your next evening out so you can be sure that your childcare helper has all information that might be needed. 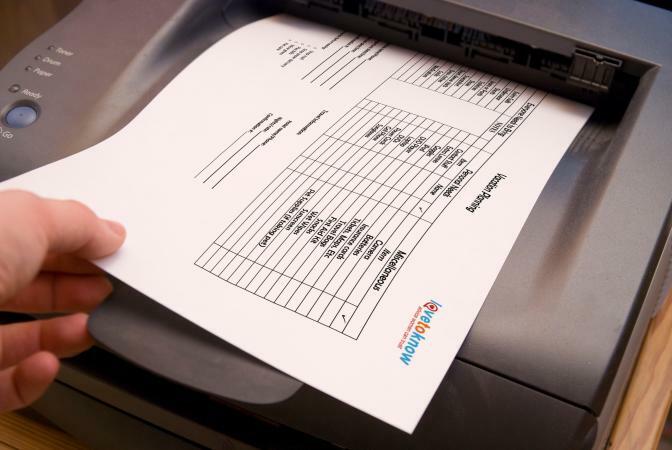 Keep family chores organized by time of day with this helpful document. Use a moving checklist when it's needed and print blank organizer pages if you need to create your own list. 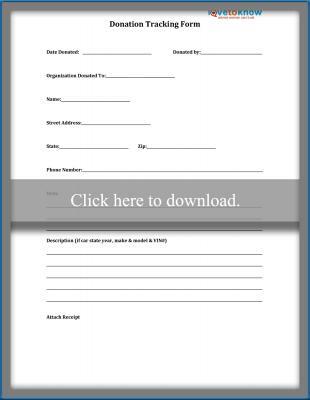 Make the change to a new home easier and more organized by using this document to get things in order. Print copies of this organizer page so you can make your own day planner with a three-ring binder. Once you have printed all the checklists that you need, you may want to keep them in a notebook planner for easy organization. 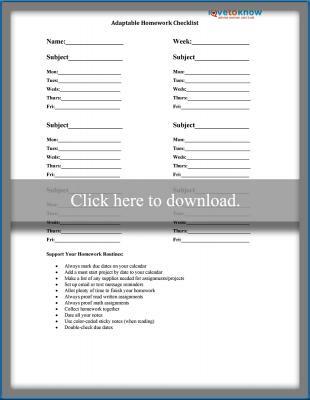 Use different color paper to print different types of checklists. This will help you keep things easy to find when you are in a hurry. 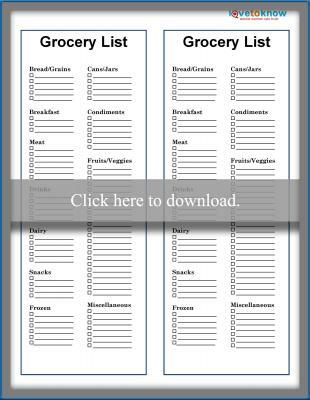 Save trees and create reusable checklists by laminating your lists. Use a dry erase marker to check off the items as you do them. When you are done with a list, wipe it clean and use it again. Keep your checklists where you can see them and get in the habit of using them regularly. After all, they won't work if you don't use them. Choose when you want to get things done and then do them. 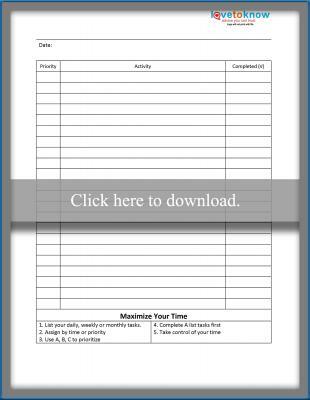 In this way you will be controlling your time rather than your chores controlling you the printable to-do lists that you can download here will keep you on target with your goals. Adjust them to meet your specific needs and keep reminders handy for the little things you might otherwise forget.